In the short book The Snowden Operation, The Econonmist‘s Edward Lucas presented a short case against Edward Snowden’s leak of classified intelligence material. He also made a case for the leaks being heavily influenced by Russian intelligence services. As someone who has previously been fairly sympathetic to Snowden’s claimed motives, I found this alternative take revealing. Lucas made some great points about the disproportionate harm caused by Snowden’s actions, especially in contrast to the minimum actions he could have taken to achieve the same ends. This book also changed my mind a bit about the nature of the public debate around the intelligence services (though I don’t totally buy Lucas’s “regulate the use rather than the development of tools” approach). I really enjoyed Tim Harford’s latest book, Adapt. Harford gave lots of examples of successes resulting from review and adaptation, and made a good case for embracing, as opposed to rejecting, failure. He made the often overlooked and very important case for allowing variation in systems, and not expecting constant equality: something that health systems in particular are not great at understanding. 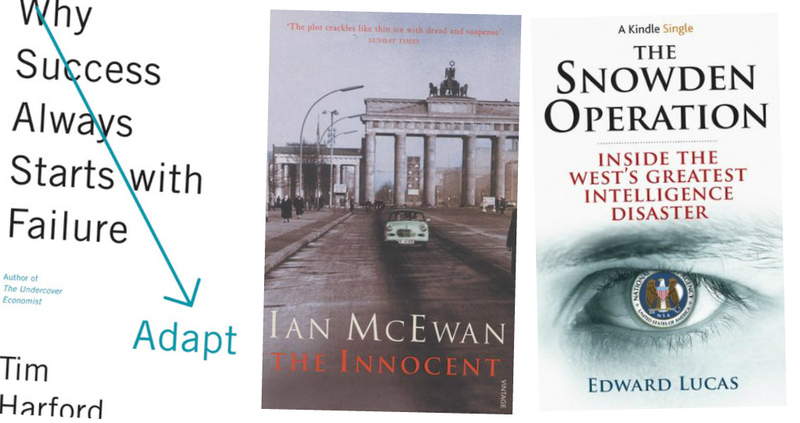 I didn’t get on well with McEwan’s The Innocent. It seemed to be a combination of spy thriller, coming-of-age novel, absurdity-of-war satire, and a reflection on cultural politics. The prose was sublime, almost poetic, as McEwan’s writing always is – but it didn’t quite hang together for me. Maybe I was just in the wrong mood. This 2,319th post was filed under: What I've Been Reading.